The hand is held closer to the chest than in the Abhaya Mudra. The palm is facing outward. A circle is made with the index finger and the thumb. The other three fingers point upward. Initially made with the right hand, later on the gesture is often portrayed with both hands. Common gesture in Dvaravati Buddha images. 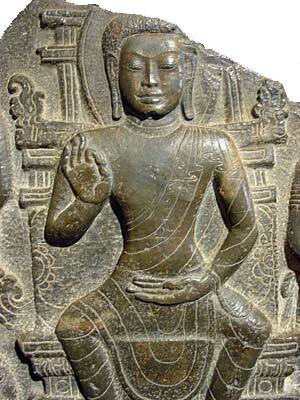 Sometimes also substituted for the Dharmachakra Mudra (see below). The Vitarka Mudra can be made while in sitting or standing position. Buddha, wearing the attributes of Royalty, in the Khmer style of the Lopburi period. With the gesture (see right hand) of preaching. Cast and enlarged from an old model. Image present in the cloister of the Ubosoth at Wat Benchamabophit, Bangkok. Stone carving of scene from the Buddha's life. Dvaravati art 7th-11th century A.D. 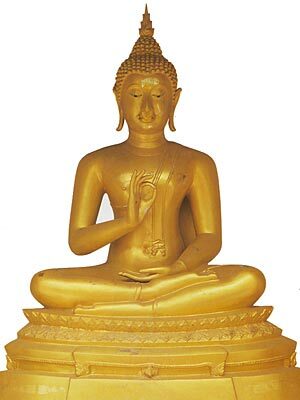 The Lord Buddha is seated in so-called 'European' fashion. Dharavati art - Standing Buddha with two hands displaying Vitarka Mudra. 7- 9 th century A.D. The Buddha went to the Deer Park at Isipatana near Benares and preached his first sermon to a group of Five Disciples. Buddha image at Phra Pathom Chedi.